For the whiskey lover in your life, these Crown Royal Cupcakes are infused with the bold flavor of Crown Royal and filled with chocolate! Decadent and delicious! I am in love with my chocolate cake recipe. It is so versatile. I mean seriously. I’ve made this chocolate cake so may different ways now… It’s gone mocha/coffee, dark chocolate, Guinness, cream, and now Crown Royal Reserve. I love the fact that just replacing this one ingredient, substituting just this one aspect of the cake can change the flavor so drastically. It’s amazing! The cupcakes I made today are full of Crown Royal Reserve flavor. The aroma of the batter was extremely intense and tasted so incredibly delicious. The whiskey flavor was strong, but not over powering. It was perfection. Inside these cupcakes is a spiced chocolate cream I had left over from the pumpkin spice cupcakes I made last week. 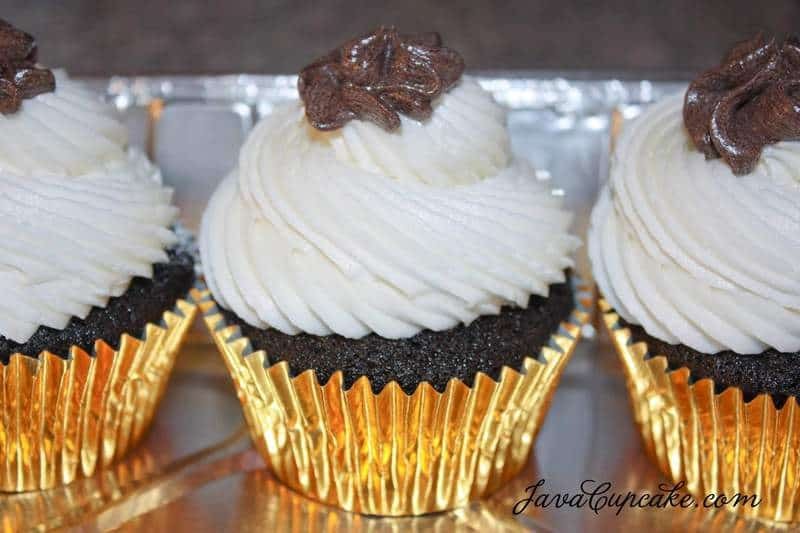 I just whipped it up until it was smooth, added a tablespoon of Crown Royal to it and it was silky, smooth and perfect to fill these cupcakes with. 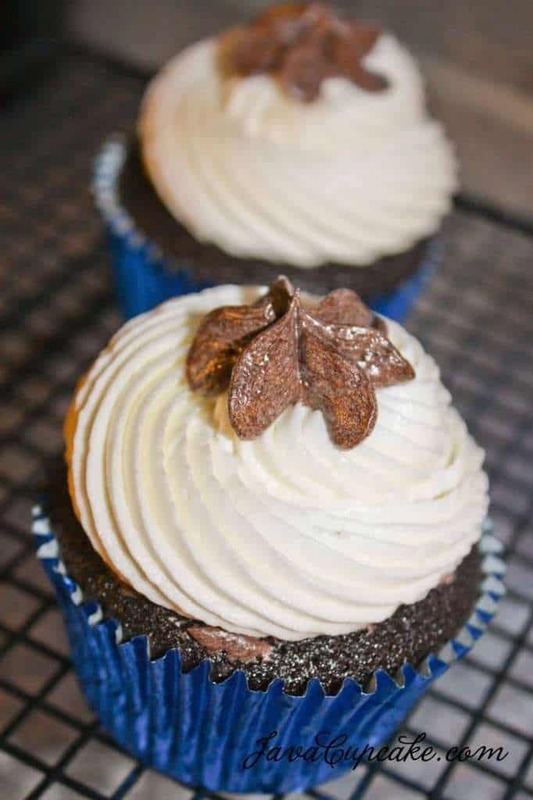 Topping these cupcakes is a cream cheese frosting with nothing but Crown Royal Reserve as the flavoring garnished with a dollop of the same chocolate cream as in the middle of the cake. Crown Royal infused dark chocolate cake filled with spiced dark chocolate cream topped with Crown Royal frosting. Perfect for the CR lover in your life! Once melted, add the Crown Royal and cocoa powder and whisk until smooth. Bring just to a boil then remove from the heat to cool slightly. While cooling, whisk together the eggs, sour cream and milk in a medium bowl. Slowly pour 2-3 Tbsp of the chocolate mixture into the egg mixture and whisk until smooth. Pour the rest in and whisk until combined. Make a well in the flour and pour in the wet mix. Whisk until smooth. Fill cupcake liners 3/4 full. Bake for about 18 minutes or until a toothpick comes out clean. Allow to cool in pan for 5 minutes before removing to wire rack to cool completely. Using about half of the frosting from the this recipe, add 1 Tbsp of heavy cream. Using the whisk attachment on your stand mixer, whip frosting until light and fluffy. Core each cupcake and fill with the chocolate cream. Add the powdered sugar and beat on high until smooth. If it becomes too thick to mix, add the Crown Royal to loosen up. Mix in the salt and beat on high for 3-4 minutes. Pipe frosting onto cupcakes and top with a dollop of the dark chocolate cream to garnish. Guess I will be going to the liquor store today so that I can make these. They look delicious. Thanks so much for sharing the recipe. You are awesome! These look amazing! Can I ask…what tip did you use for the frosting? I don’t know the number, but it’s a multi pronged large open tip. can you use crown royal apple or do you have a specific recipe for this flavor yet? Try to find a recipe that we can use for a wedding reception. I came back from a cruise with 2 L of Crown Royal (my favorite) and I was beginning to wonder if you could bake with it! I am making these this weekend! You are amazing! Excellent! Let me know how they turn out! I know, right!!? 🙂 SO YUM! Is it really 2lbs. of Powdered Sugar???? for frosting for 2 dozen cupcakes, yes! These cupcakes are delicious ! I recently made a batch for a family function and there wasn’t a crumb left. Absolutely awesome recipe ! can I add crown royal to the chocolate cream??? Sure 🙂 You can use in it place of any flavoring! How many cupcakes does the crown royal recipe make? Can you use this same recipe but make it in cake form? For the filling did you use the frosting recipe from the other site or the cupcake recipe for that ark choclate? 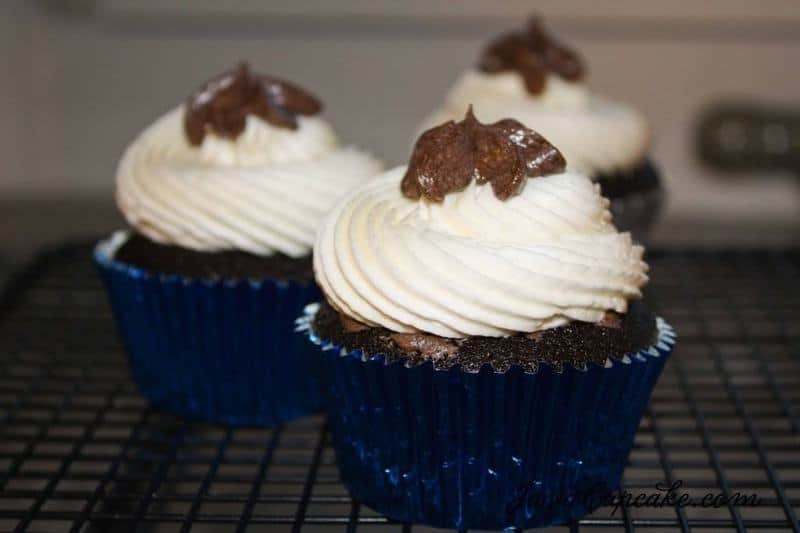 The filling recipe for these cupcakes is the dark chocolate frosting from the Owl Cupcakes recipe. The links are provided in the recipe list! Happy Baking! I can’t wait to make these for my soldier! Thanks for the recipe. Hi Betsy! These look amazing! I want to make these for a birthday but only need to make a dozen..would halving the ingredients give me the same result? Hi Shal! 🙂 You should easily be able to cut the recipe in half. But, to be honest… you should just make all 2 dozen and share with your friends!! hehe 🙂 Happy Baking! Hoe do you make the well. Is it a special cupcake pan? I am new to the baking cupcake thingy. Hello! To make a well, simply move the flour to the side until you’ve created a small opening in the flour. Basically, you’re making a space to put the wet ingredients in so you can have more control over mixing them into the flour. Does this help? Wondering is it suppose to baking powder and not baking soda? How do they rise? Hello! These cupcakes look delish! Do you need vanilla for the frosting? Just making sure it wasn’t left out by accident. I’m making a birthday cake for my friend! Thanks for sharing! I didn’t make the filling but I will say I was the talk of the party! So so so so delicious! These sound great! Can I omit the cocoa powder and use vanilla for vanilla flavored Crown Royal cupcakes? Hi, I made these and I had GREAT reviews, my question is, could I substitute Crown for Hennessey? Would the alcohol volume difference cause an issue in baking and instead of 3/4c of alcohol could I add 1c or would that change the consistency of the cupcake? Thank You! Roddy – Yes – you can use whatever alcohol you want!! However, be careful when replacing the amount of liquid. Check the consistency of your batter after 3/4 cup and see how thin it is. 🙂 Happy baking!